Pam Didner is a B2B and B2B2C marketing consultant, writer, speaker and author of 2 books: Global Content Marketing and Effective Sales Enablement. She has given presentations and workshops in the US, Europe, South America, and Asia. Her forte is to create successful global marketing plans that meet local marketing and sales team’s needs. She is strategic in nature and tactical in execution. She also specializes in sales, marketing and internal/external communications consulting, keynote presentations, corporate training, and workshops. She shares marketing thoughts at pamdidner.com and contributes articles to the Guardian, the Huffington Post, Content Marketing Institute, and other publications. Follow her on Twitter @PamDidner. Editor’s note: Pam Didner recently authored the book Effective Sales Enablement for marketers. 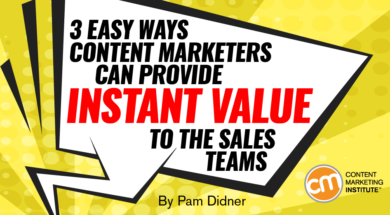 In this article, she shares that perspective with three ways content marketers can provide value to the sales team. Most content marketers focus on meeting marketing’s needs to build brand awareness, drive demand, or nurture prospects to convert them to qualified leads. Marketing, working with business units or product marketing, generates many content pieces and customizes them to satisfy various marketing channels. Earlier in my career when I was managing the creative development of global campaigns, my geographical counterparts often pointed out that creative needs to be customized or localized to reflect cultural differences. Today, as a global marketing manager, I wonder if it’s truly possible to create a global creative concept and apply it to all regions around the world. For a long time I assumed that as long as the creative concept was headline-driven or provided simple background information without including details on specific figureheads, it would be easy to scale to other regions. I now realize that this is only partially true. There are a lot of factors influencing the development of a creative concept, but the Holy Grail (or the determining factor) of globalizing a creative concept starts with your company’s products. Let me illustrate with three different examples. I often say in talks and articles that content is king, creative is queen. In other words, if you’re going to produce an exceptional product, you must bring your creative department into the process from the beginning. With that in mind, here’s the story behind Intel’s the Museum of Me. How do you break through the deluge of constant texting, e-mailing, Tweeting, ”Facebooking,” and online gaming to reach your audience in a meaningful way? One answer: It’s not only what you deliver (content) but also how you deliver it (creative). Even when you have solid product messaging and a good story line, how you deliver your content can make the difference between standing out among the message flood or getting lost in it.